3 Steps to Smooth Skin smooths away bumps and softens and moisturises rough, dry skin caused by Keratosis Pilaris. Our simple, proven formula, Exfoliate + Cleanse + Transform, is designed so each step enhances the next, smoothing bumps and leaving your skin softer, renewed and moisturised for 24 hours. Pack includes 50ml Smoothing Body Exfoliant, 60ml Nourishing Body Wash and 50ml Transforming Body Lotion. 1. EXFOLIATE with gentle Bamboo granules, Alpha Hydroxy Therapy and LaH6 Skin Hydration Complex. Our Smoothing Body Exfoliant moisturises and removes dead skin cells to prepare skin for step 2. We recommend you use it on dry skin and leave it on a minute or two before you shower or bath. 2. CLEANSE with our Omega Oil rich, ph-balanced, soap-free Nourishing Body Wash which protects the moisture received by step 1 and adds a second hit of hydration with its own LaH6. 3. TRANSFORM your skin with our Transforming Body Lotion! 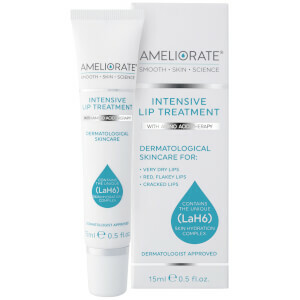 Optimum levels of Alpha Hydroxy Therapy gently exfoliate and moisturise while a 3rd helping of LaH6 leaves your skin beautifully hydrated for 24 hours. Independent consumer research tested on 50 people with very dry, dehydrated, rough or bumpy skin. DIRECTIONS: Use 2-3 times weekly. Massage into DRY skin before showering or bathing. Leave on the skin for a few minutes to ensure the product works to its optimum before rinsing off. For progressive improvement in skin texture and condition follow with Nourishing Body Wash and AMELIORATE Transforming Body Lotion. DIRECTIONS: Squeeze into hand and lather over wet skin, rinsing well after use. 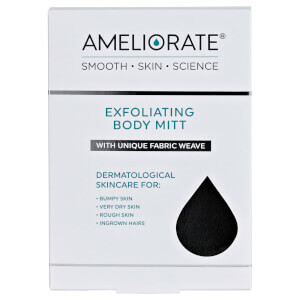 For progressive improvement in skin texture and condition follow with AMELIORATE Transforming Body Lotion. , C12-15 Alkyl Benzoate, Cetearyl Alcohol, Petrolatum, Butyrospermum Parkii (Shea) Butter, Isopropyl Palmitate, Polysorbate 60, Glyceryl Stearate, PEG-100 Stearate, Dimethicone, Phenoxyethanol, Sodium Carbomer, Sodium Benzoate, Cocos Nucifera (Coconut) Oil, Theobroma Cacao (Cocoa) Seed Butter, Fragrance (Parfum), Potassium Sorbate, Hydrolyzed Milk Protein, Xanthan Gum, Disodium EDTA, Pentylene Glycol, Lactic Acid, Serine, Sodium Lactate, Sorbitol, Urea, Linalool, Citronellol, Citrus Aurantium Dulcis (Orange) Oil, Juniperus Mexicana (Cedarwood) Oil, Sodium Chloride, Pelargonium Graveolens (Geranium) Oil, Allantoin.